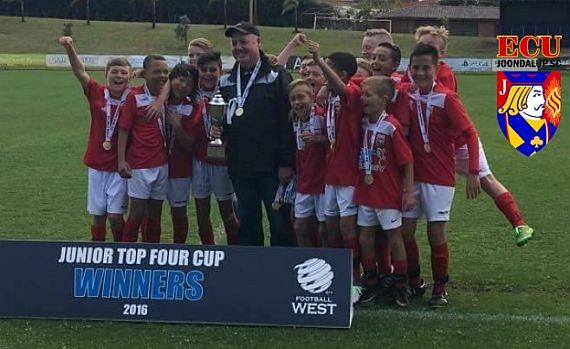 ECU Joondalup under 12’s have taken out the 2016 PS4NPLWA Top Four Grand Final after a 2-0 win against local rivals Sorrento at the E&D Litis Stadium on Sunday morning. They were ahead when Toby Snook scored from the penalty spot, before the win was secured with a stunning 20-yard screamer from Mason Gallagher. It was a hard fought game, with both sides giving it their best but the Jacks prevailed and Coach Willie Kelly said it ended the season for the youngsters on a high. “It’s a pleasing way to end a successful season, I’m really pleased for the boys, they have been magnificent all season,” Kelly said. “Like all finals it was a tough game and against our local rivals Sorrento too, but the players went out, played well and I think they enjoyed it, the coaches did.